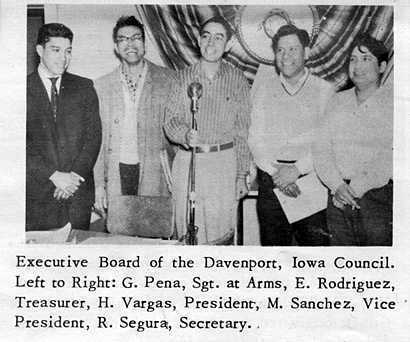 In 1959 Henry Vargas conceived the idea of organizing local Mexican Americans of Davenport with the hope of achieving political strength with a united front. His brother Jesse persuaded the group to join forces with a group he was already affiliated with, the Scott County Young Democrats. Shortly thereafter, Chai Vasquez, originally from Fort Madison, informed the group of LULAC and its purpose to improve the social and economical conditions of Hispanics. At a meeting organized by Vargas and Ernest Rodriguez, Vasquez introduced Jesse Mosquada of Des Moines to the group. Mosquada was the LULAC Regional Director at the time. 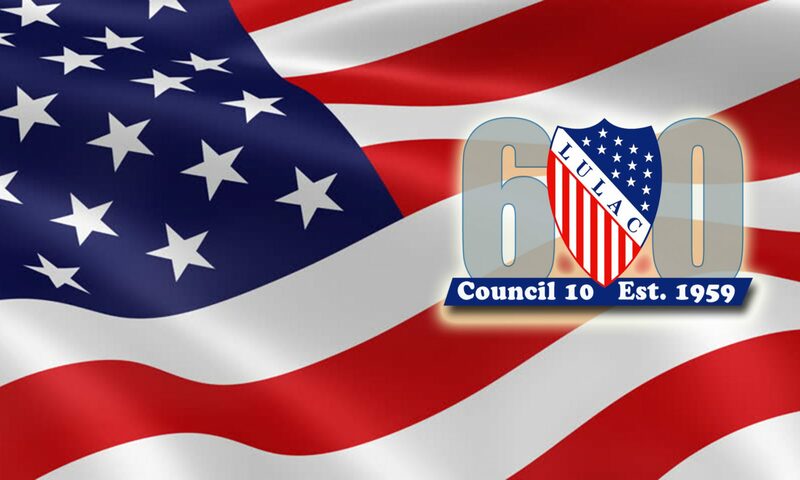 As a result of that meeting, LULAC Council 10 was chartered on February 16, 1959. At that time there were four other LULAC councils in the state of Iowa: #304 in Fort Madison the state’s first, #306 in Des Moines, Ladies’ Council #308 in West Des Moines, and #319 in Mason City. Most of the original members of Council 10 were second and third generation Mexican Americans whose parents came to the area to work on the railroad or at foundries such as The Bettendorf Car Company. Some also hired on at International Harvester or John Deere. Upon its formation, the council had an immediate impact on the community. From successfully representing Gilbert Fernandez, a local businessman involved in a dispute with the city, to raising funds for the Heart Foundation, to becoming active participants in the city council and the Davenport School District. In the early days Council 10 met wherever they could – at the YMCA, and various taverns. In 1961 the council leased a storefront on Perry Street in downtown Davenport and opened an establishment known as The LULAC Club. Meetings, other council business and many social events were held there until 1969. It was then that the council made the move to its present location at the west end of Davenport. This property was acquired through a bidding process from the Davenport School District at a cost of $12,500. Over the years the building and grounds have seen many improvements, dances, fundraisers, political events – and bingo. In fact, the ongoing bingo operation has been the steady mainstay of the facility since the council moved there in 1969. The staying power of the weekly bingo operation is owed largely to Salvador Lopez, who, incidentally, was one of those second generation members who started this council in 1959. Throughout the 1970’s and 1980’s the council stood up time and again for la causa de La Raza – the rally cry at the time. The Spanish Speaking Task Force in 1974, the Illinois Migrant Council, and the Grape Boycott Committee are but a few challenges where Council 10 made its presence felt. The last three decades of the 20th Century were a time when the members of Council 10 had an immeasurable impact on the Hispanic experience in the Quad-City area. But another challenge was looming on the council’s horizon. By 2006 the warriors who fought so many battles in the name of social justice for their Latino brothers and sisters were getting tired. And their numbers were dwindling as well. By 2008 membership was down to 46 members. The following year Michael Reyes was elected president of the council and things immediately began to change. He began the Council 10 comeback by seeking out and receiving badly needed funding to upgrade the facility. At the same time, Reyes dramatically improved the council’s flagship scholarship program. The amount awarded to deserving college bound students has increased by 500% since 2007.